Whenever headlines carry the painful images of human being caught in the path of catastrophic flooding, we should all take a few moments to contemplate how quickly nature can become our greatest adversary. Water is both the source of all life and the greatest destructive force on earth. I ponder the paradox in these reflections from after the Pacific Rim tsunami of 2005. The Talmud, however, reports a much more enigmatic account of divine intervention through water. It was in a time of terrible drought that the Jewish people approached the sage Choni HaMagil and beseeched him to pray for rain on their behalf. 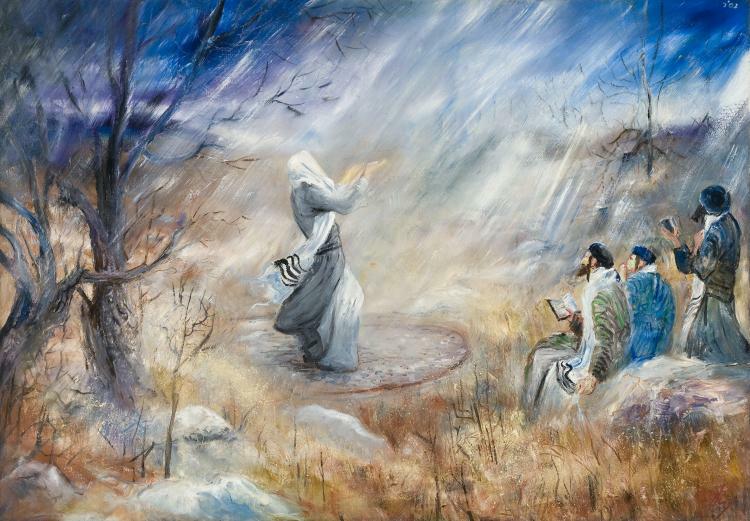 When Choni’s supplications to the Almighty went unanswered, he drew a circle in the dust and stepped inside of it, vowing not to leave the circle until G-d bestowed rain upon His people. One last time Choni called out heavenward: “Master of the World, Your people, Israel, whom You brought out from Egypt, can tolerate neither too much blessing nor too much misfortune.” Immediately the waters abated, and the people returned to their fields. From this time onward, people referred to Choni by the name HaMagil — the Circle-maker. What was the point of G-d’s demonstration to the people of Israel? What did Choni mean that the people could not tolerate too much blessing? And why did Choni find it necessary to remind the Almighty, at this particular moment, that He had brought the Jewish people out from Egypt? Moreover, He promised them immeasurable blessing and unbounded prosperity, on condition that they would repay their loan — repay it by living according to G-d’s law, repay it by rising above material pursuits and petty self-interest, repay it by using all the blessing that G-d would bestow upon them to aspire to moral, ethical, and spiritual perfection. By all accounts, the world that we live in today enjoys a level of material affluence unattained and unimagined by previous generations. Such basic necessities as rapid transit, instantaneous communication, indoor plumbing, electrical lighting and refrigeration, which we take for granted, provide us with an ease of living simply unavailable to even the wealthiest, most powerful monarchs until the last century. The very existence of an “entertainment industry,” much less the staggering sums of money devoted to it, testifies to our abundance of resources — which is to say, our abundance of material blessing. It is only just that those who are blessed share a portion of their blessing with their less fortunate neighbors. It is only just that, before overindulging in one’s own good fortune, he ponders why he deserves having received such blessing while his neighbor has not. And it is only just that he ask himself how, even in the absences of tax incentives or legal mandate, he might reach out with his blessing to ease his neighbor’s plight. If the waters of the earth, the life-giving waters that are the source of our greatest blessing — life itself — have risen up to inflict enormous tragedy, swallowing human life and draining billions of dollars of aid to spare human suffering, we will all be remiss if we do not pause to consider whether we have used our blessings wisely, and what we must do to ensure that we will continue to deserve them. Originally published by Jewish World Review. By Yonason Goldson in Culture, Headlines, Moral Compass, Philosophy, Psychology, Science and Nature, Society on February 21, 2017 .